NEW DELHI: Businessman Robert Vadra today moved a Delhi court seeking anticipatory bail in a money laundering case filed by the Enforcement Directorate. 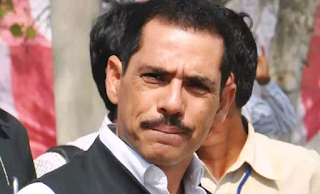 A lawyer from the prosecution team confirmed that Mr Vadra has sought anticipatory bail in the case in which his close aide Manoj Arora was granted interim protection from arrest till February 6. The case relates to allegations of money laundering in the purchase of a London-based property -- located at 12, Bryanston Square -- worth 1.9 million pounds, which is allegedly owned by Mr Vadra, the brother-in-law of Congress President Rahul Gandhi.